Upon hearing of the death of Gregg Allman, I was transported back to the night I first heard The Allman Brothers Band in concert. Their first Lp had been released on Atco/Capricorn in late 1969 and they immediately went on tour supporting the J. Giels Band. Saw them at an old concert hall in Springfield, Massachusetts. When they hit the stage, there may have been 30 people in the audience but the ABB rocked as if the house was full. Gregg sat behind his Hammond B-3 organ, belting vocals, his brother Duane and Dickey Betts trading solos that roared through the auditorium while the rhythm section - drummers Jai Johanny Johanson and Butch Trucks plus bassist Berry Oakley - pounded away and played heart-thumping bass. I was covering the event for our campus newspaper so I got to go backstage to visit the band as the headliner was setting up. They were excited about how well the set went and that they were getting press coverage - they were fine Southern Gentlemen, offering my girlfriend and I beers. I talked about the Blues with Gregg for a few minutes, amazed that someone just 16 months older than me could sound a 60-year old bluesman. He laughed and pointed to the cigarette in his and try beer in his hand, stating that these were "two reasons I can shout." Got a minute to chat with a few others before they headed out to the tour bus - never did stay to hear the J Giels Band (though I did see them the following year). 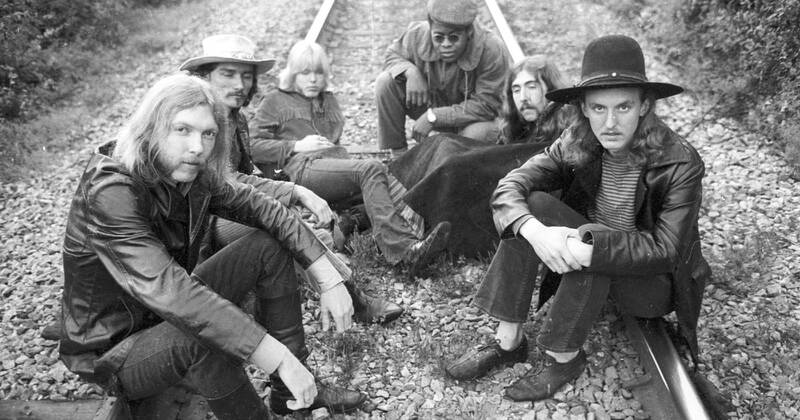 After Duane died in 1971, I lost interest in the band (although I wore out the grooves on "Live at The Fillmore East"). 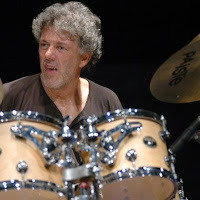 Gregg carried on with the band until 1975, started a solo career that had its ups-and-downs (his 2011 collaboration with T-Bone Burnett, titled "Low Country Blues", is an excellent recording), rejoining the group in 1989, an ever-shifting lineup that lasted another 25 years. Drummer Tiziano Tononi (pictured left) is one of the last people I expected to record a tribute to The Allman Brothers Band but his new album "Trouble No More...All Men Are Brothers" (Long Song Records) is a loud and loving tribute to the group with a focus on the earlier recordings mixed in with a pair of Dickey Betts songs and three originals. Tononi has assembled quite a group - what's interesting on first glance about Southbound is that there are no guitars or keyboards (save for Carmelo Massimo Torre who plays accordion) and the lead instruments are Emanuele Parrini (violin, viola) and Emanuele Passerini (tenor and soprano saxophones) plus Piero Bittolo Bon (alto sax, bass clarinet, flutes). 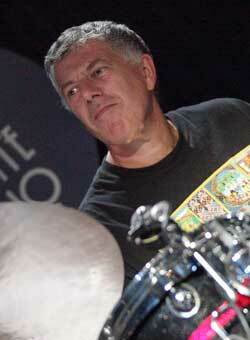 The rhythm section features Joe Fonda (electric and acoustic bass) and Pacho (congas, bongos, and percussion). The majority of the tracks also feature the voice of Marta Riviglia, who has worked with all sorts of ensembles from symphony orchestra to jazz quartets to duos and more (and working a lot with electronics). If all you know of Tiziano Tononi is the work he has done with tenor saxophonist Daniele Cavallanti (on albums dedicated to Ornette Coleman, Roland Kirk, and Don Cherry, among others with original works), this music will probably surprise you as well. The album opens with an explosive reading of "Whipping Post" which has such an exciting forward motion created by the bass and drums) - there's also a tumultuous soprano sax solo (the "reprise" shows up after the second track and is more diffuse). 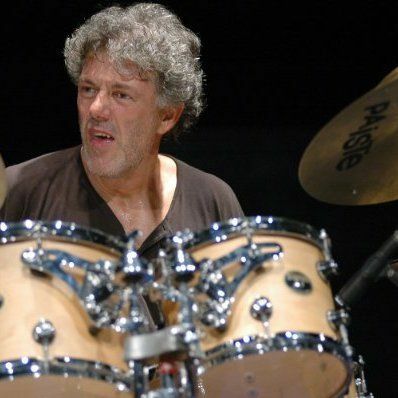 On tracks such as "It's Not My Cross to Bear", "Don't Want You No More", and Willie Cobb's "You Don't Love Me", it's a treat to hear the drummer lock in Fonda and play such high-energy blues (the latter song feature a smashing interchange between viola and accordion!) Bittolo Bon opens "...Cross to Bear" with a rip-roaring alto sax solo followed by Ms. Riviglia digging into the lyrics shadowed by Parrini hard-edged violin. Passserini's tenor plays a hardy solo in the middle before the bands quiets down for a delightful accordion spotlight. Listen to the ensemble rip through "Hot 'Lanta" featuring burning solos from Parrini, Passerini (soprano), and Bittolo Bon (bass clarinet) fired up by the blazing drums, congas, and the hard-edged bass playing. Arguably the best track on the album is the Eastern-sounding take of "Midnight Rider" (video below), replete with droning accordion, lively bongos, urdu drums, double-tracked vocals, and haunting bass flute solo. The exotic sounds carry over to the drummer's original piece "For Berry O." but here it's just gongs, shaken percussion, cymbals, steel drums, accordion, congas, and drum set but no voice, strings, or reeds. Another original work in "Requiem For Skydog", a deep blues dedicated to Duane Allman that features solos from alto and tenor saxophones plus violin as well as impressive acoustic bass melodies. Mr. Cavallanti shows up on a rousing take of King Curtis's "Soul Serenade" joined by the squalling soprano sax. The best part may be Cavallanti's unaccompanied coda, the only time the main melody of the song is played. The only misstep (to me) is the final track, "You Don't Love Me (glorious ending)" with Ms. Riviglia riffing on the lyrics in a duet with herself while the band initially wails away. Everyone drops out but the vocalist and the leader, then the voice departs and it's just the drums taking the album to its conclusion. 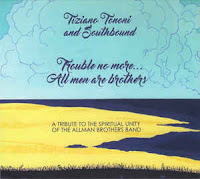 However, "Trouble No More...All Men Are Brothers" (subtitled "A Tribute to the Spiritual Unity of The Allman Brothers Band") is quite an exciting project. Starting with the powerful rhythms, adding Marta Riviglia's expressive vocals punctuated by the reeds, strings, and accordion, Tiziano Tononi and Southbound give their all to honor a band that has quite an effect on the United States and beyond. For more information, go to www.longsongrecords.com.